The Federal Data Center Consolidation Initiative (FDCCI) has been suspended as of March 2016, and the Office of Management and Budget (OMB) is pushing forward a memorandum called the Data Center Optimization Initiative (DCOI) in its place. “The DCOI, as described in this memorandum, requires agencies to develop and report on data center strategies to consolidate inefficient infrastructure, optimize existing facilities, achieve cost savings, and transition to more efficient infrastructure, such as cloud services and interagency shared services,” the memorandum draft states. In light of the Federal Information Technology Acquisition Reform Act (FITARA), which was signed into law in 2014, and recent executive orders on the optimization of Federal IT, the DCOI aims to change the way agencies handle, and ultimately get rid of, their data centers. “The CIO is the owner of the data center’s consolidation and optimization strategy. They are the ultimate decision-making authority,” said OMB Policy Adviser Sean Casey in a panel on OMB’s approach to FITARA on March 30. As acting executive director of FITARA at the Department of Agriculture, Flip Anderson noted in a separate panel that day, this requires the CIO to be more involved in budgetary and project planning processes than usual, as they will be responsible for the ultimate result of those processes. “One of the key differences between the FDCCI and the DCOI is around how data centers are categorized. FDCCI uses core vs. noncore, while DCOI is using a tiered vs. nontiered approach,” Casey said. This categorization mirrors what the private sector is already doing. This definition both allows for different types of data centers to be included, and adds server closets and the like into consolidation numbers where they were previously ignored. Ultimately, DCOI encourages agencies to drastically reduce the number of data centers in use and to convert to cloud-based services where possible. There are four major goals within the data center consolidation objective: freeze the expansion and creation of data centers, consolidate and close existing data centers, encourage cloud investment, and create shared services across agencies. “The March 19, 2015, Executive Order 13693, ‘Planning for Federal Sustainability in the Next Decade,’ requires agencies to install and monitor advanced energy meters in all data centers by September 30, 2018,” the memorandum says. OMB plans to enforce this by requiring agencies to install energy monitoring tools and to achieve and maintain a Power Usage Effectiveness of less than 1.5 by Sept. 30, 2018. Otherwise, agencies will be asked to consider consolidation or elimination of the energy inefficient data center. The memorandum also requires agencies to install automated motoring, inventory, and management tools. “We would like agencies to stop relying on manual data collection,” said OMB policy analyst Michelle Bacon at the March 30 panel. DCOI also sets a target for cost savings and avoidance as a result of data center consolidation and optimization. 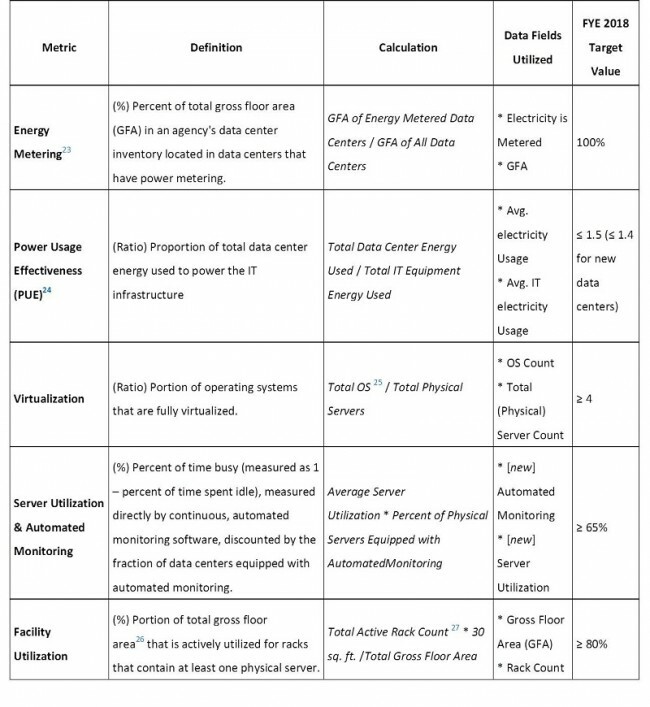 As part of the implementation of DCOI, agencies would be required to maintain inventories of their data center facilities, include progress toward optimization targets, and evaluate the cost of operating and maintaining their data center facilities. This data will be collected quarterly. Agencies are required to publish annually a Data Center Consolidation and Optimization Strategic Plan, which would lay out their plan for the next three years and begin in fiscal year 2016. Public commentary on the DCOI closed on April 1, meaning that there could possibly be changes to the details and structure of the memorandum that are currently in the works.